Compiled by Mr. Lafferty Maths Dept. 1 Compiled by Mr. Lafferty Maths Dept. S4 Starter Questions 10-Apr-17 Compiled by Mr. Lafferty Maths Dept. 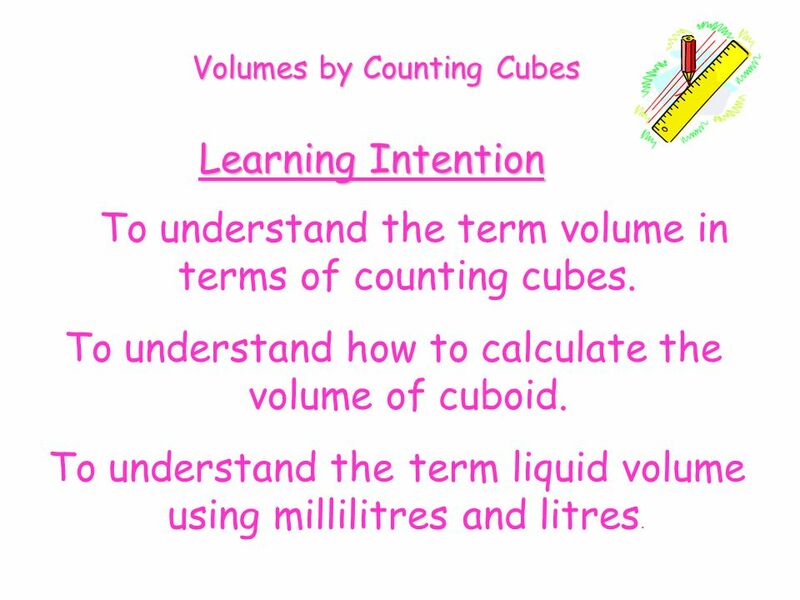 Learning Intention To understand the term volume in terms of counting cubes. 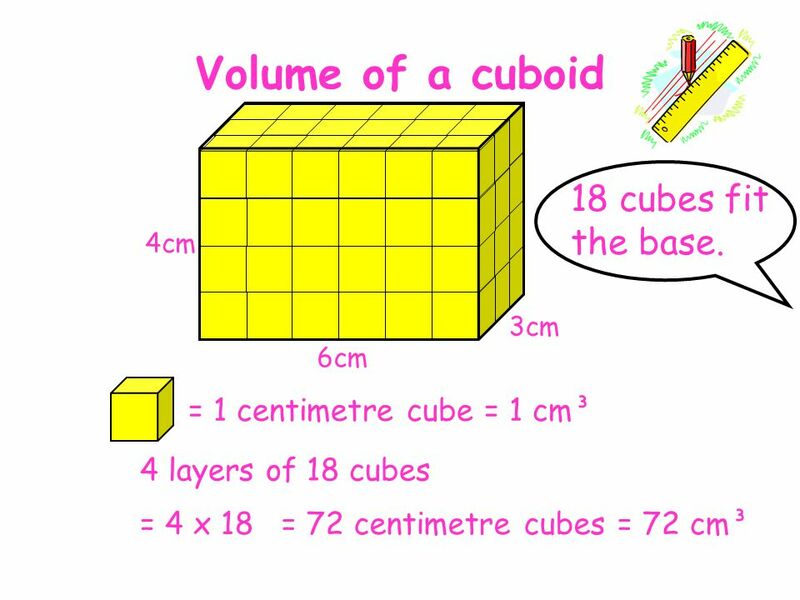 To understand how to calculate the volume of cuboid. 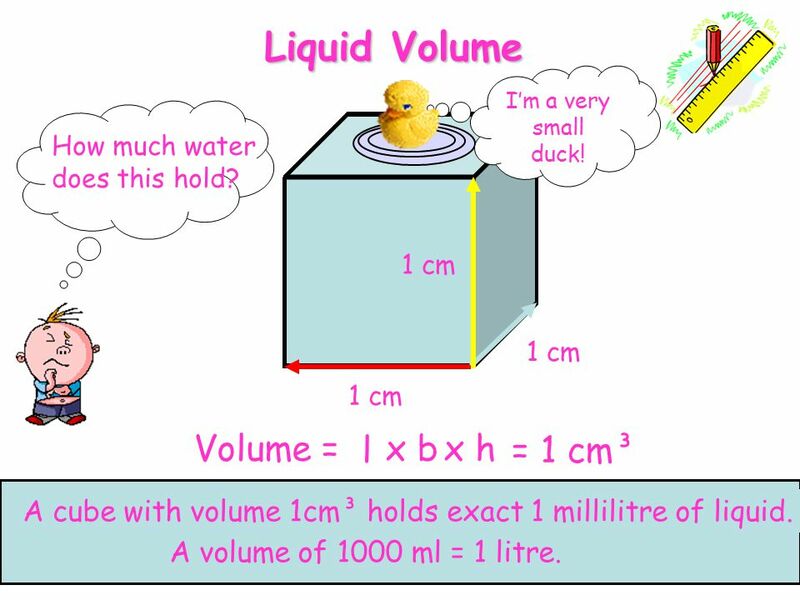 To understand the	term liquid volume using millilitres and litres. 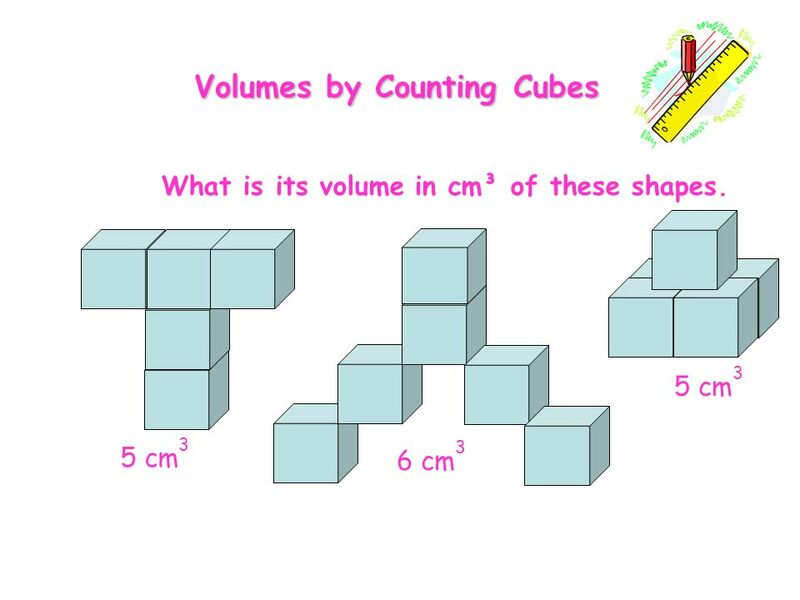 6 Volumes by Counting Cubes What is its volume in cm³ of these shapes. I’m a very small duck! How much water does this hold? 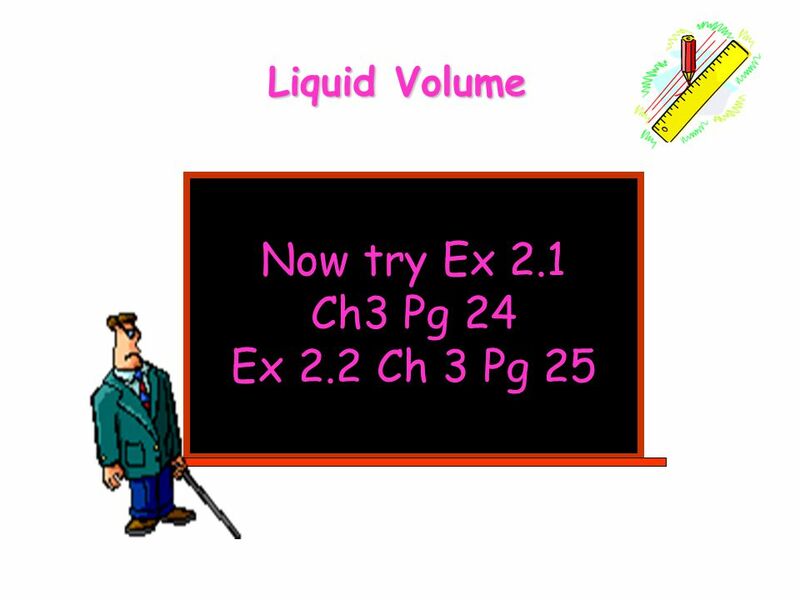 1 cm 1 cm 1 cm Volume = l x b x h = 1 cm³ A cube with volume 1cm³ holds exact 1 millilitre of liquid. A volume of 1000 ml = 1 litre. 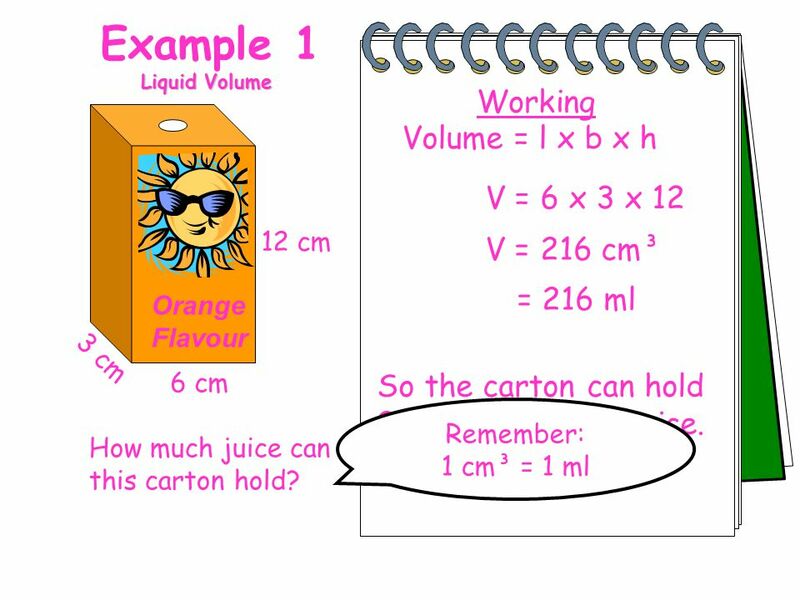 Liquid Volume Working Orange Flavour Volume = l x b x h V = 6 x 3 x 12 12 cm V = 216 cm³ = 216 ml 3 cm 6 cm So the carton can hold 216 ml of orange juice. Remember: 1 cm³ = 1 ml How much juice can this carton hold? 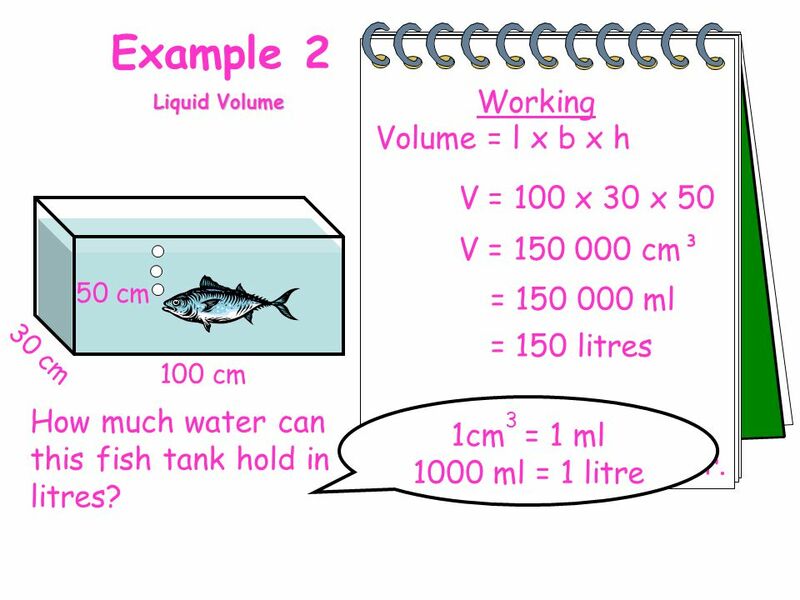 Liquid Volume Working Volume = l x b x h V = 100 x 30 x 50 V = cm³ 50 cm = ml = 150 litres 30 cm 100 cm How much water can this fish tank hold in litres? 1cm3 = 1 ml 1000 ml = 1 litre So the fish tank can hold 150 litres of water. Download ppt "Compiled by Mr. Lafferty Maths Dept." Volume p184. 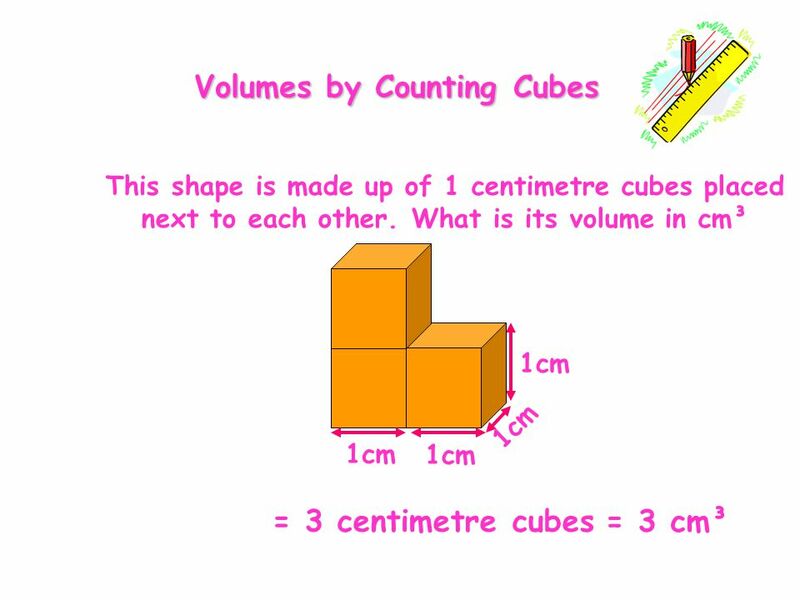 What is volume: It is the measurement of the amount of space an object can occupy. It may be solild, liquid or gas. Units of Volume Millilitre. 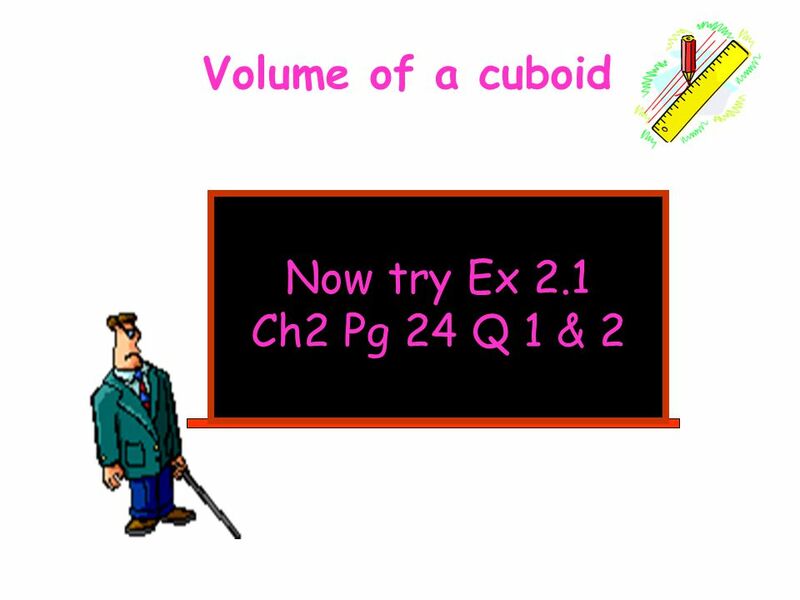 Unit 14 Volume, Sectors and Arcs Presentation 1Volume of Cube, Cuboid, Cylinder and Triangular Prism Presentation 2Mass, Volume and Density Presentation. What Is Volume ? The volume of a solid is the amount of space inside the solid. Consider the cylinder below: If we were to fill the cylinder with water. 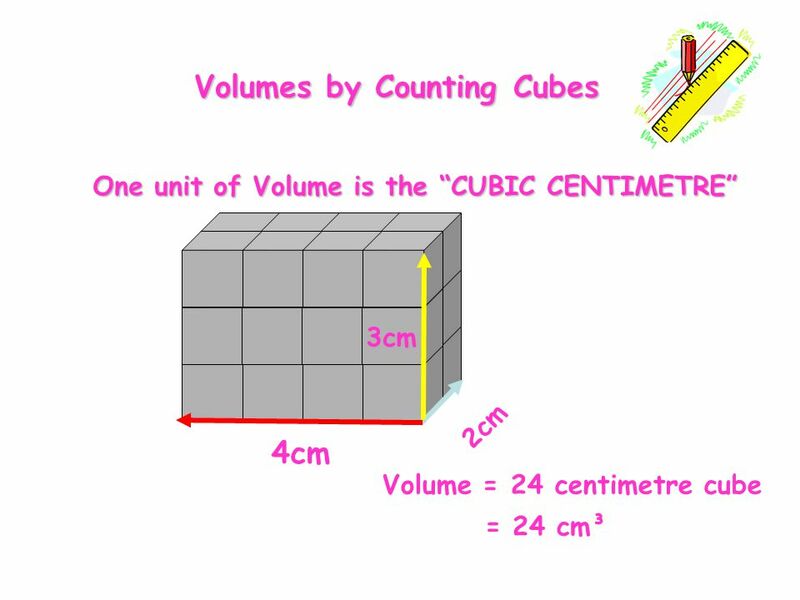 VOLUME BY COUNTING CUBES Objective To understand the concept of volume in terms of counting cubes. 3-May-15Compiled by Mr. Lafferty Maths Dept. 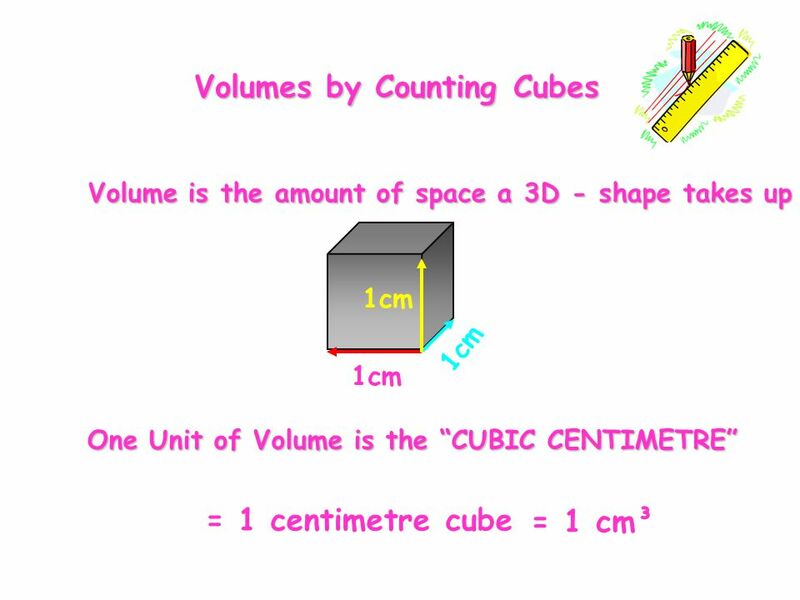 Volume Counting Volume cubes Volume of a cuboid Liquid Volume Scales S4 Weight and Scales. 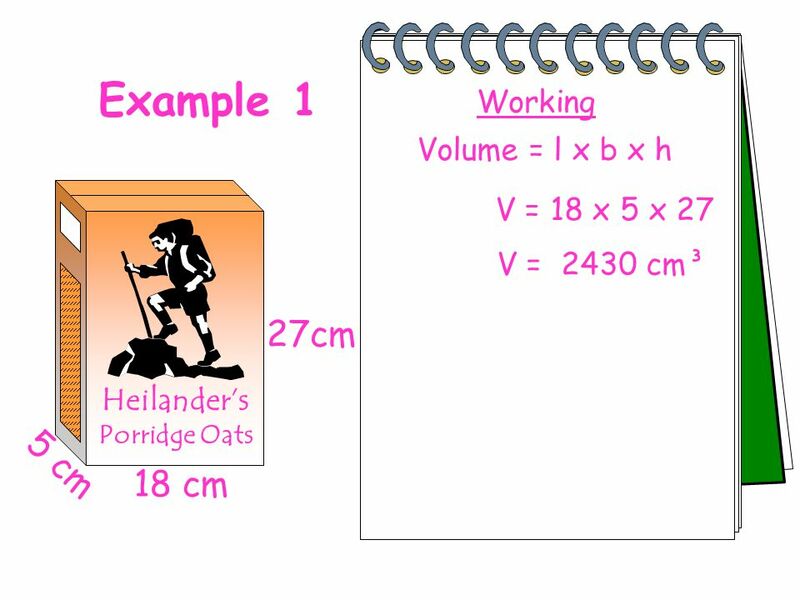 Surface Area and Volume Lesson Intentions Recap on Surface Area and Volume. 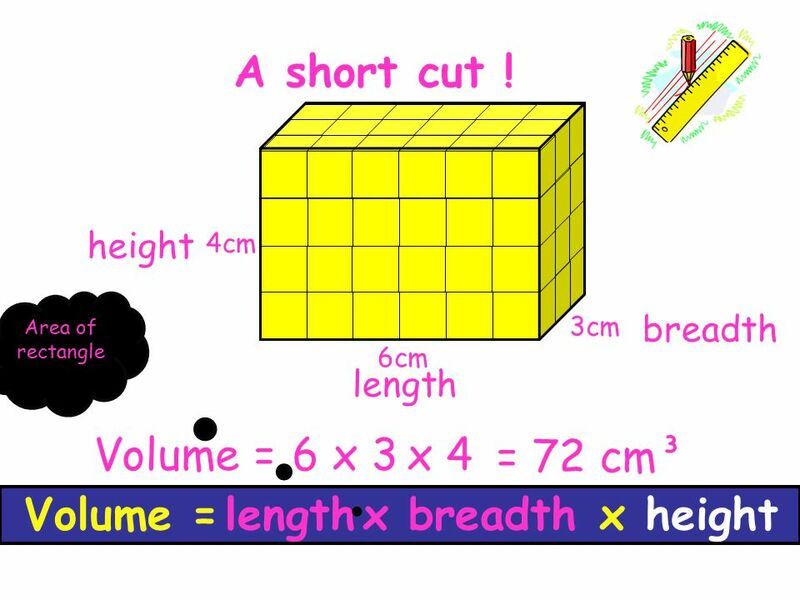 Objectives You will identify the characteristics of a cube and cuboid. 18-May-15Compiled by Mr. Lafferty Maths Dept. The Cube The Cuboid The Triangular Prism Net and Surface Area Faces Edges and Vertices. D6 Students will be expected to solve simple problems involving volume and capacity. Volume. 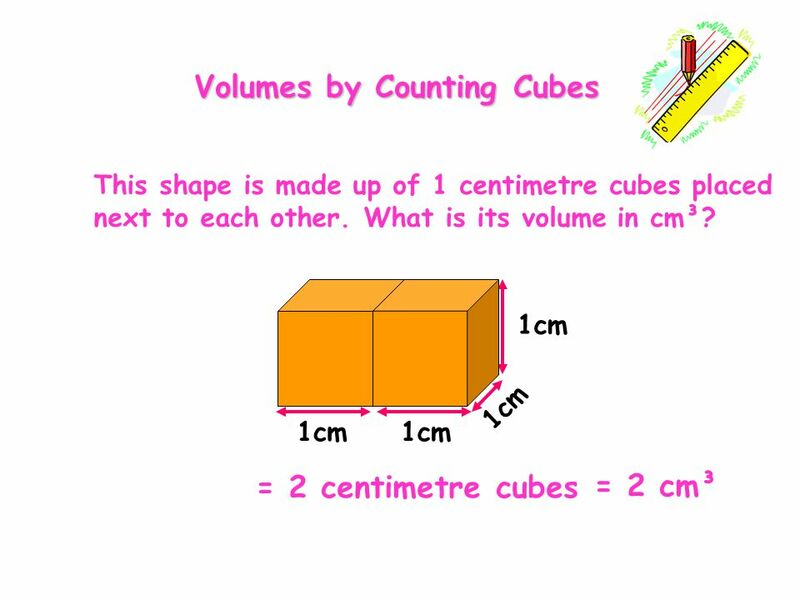 Introduction Volume is a measure of the space taken up by a solid object and is measured in cubic units such as cubic centimetres (cm³) or cubic. National 4 EF 1.2b Tuesday, 09 June 2015 Created by Mr.Lafferty Simple Areas Definition : Area is “ how much space a shape takes up” A few types of special. © T Madas. In 2 dimensions square rectangle In 3 dimensions cube cuboid. 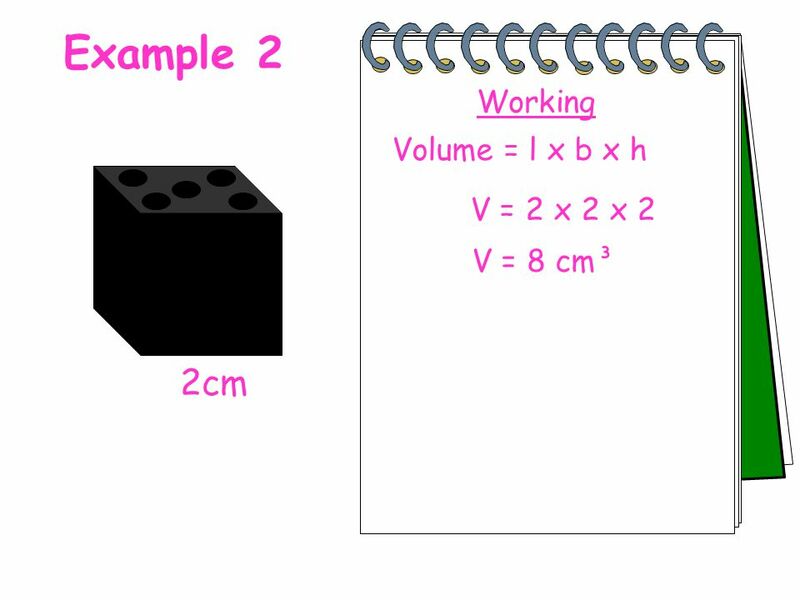 Finding the Volume of Solid Figures MCC6.G.2 – Find the volume of a right rectangular prism with fractional edge lengths by packing it with unit cubes. Area and perimeter The perimeter of a shape is easy to work out. It is just the distance all the way round the edge. If the shape has straight sides, add.